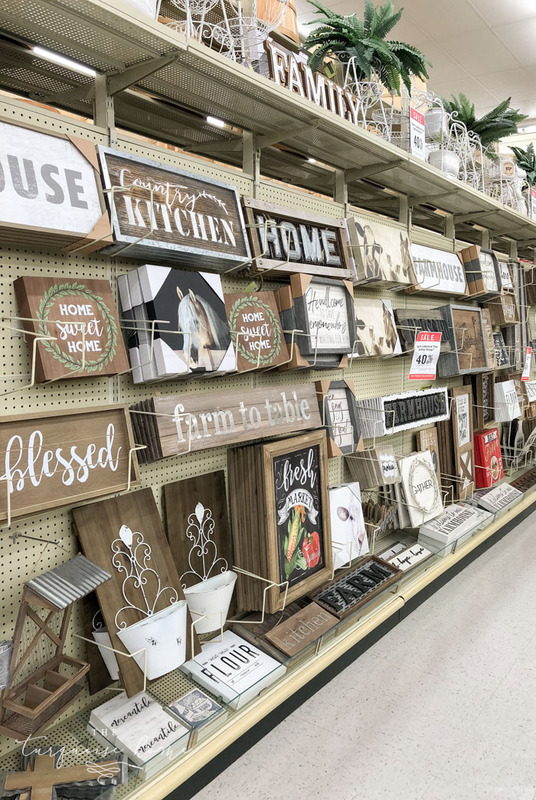 I find myself frequently stopping in at Hobby Lobby and buying the same great items! These are the items I stop in for over and over and over! And I thought it might help you in case you don’t know about some of these awesome finds! And if you have some staples that you always buy there, then please share in the comments for everyone to see! I don’t know about you, but I have that one store that I stop by almost every time I’m out. There’s always something on my “to-buy” list from there and it’s always fun to browse and see what’s new or back in stock. For me, that’s Hobby Lobby. I remember the first time one of my best friends took me there in college. I just had no idea! But I can tell you that I was hooked. And I’ve been shopping there ever since. And since I’m a creature of habit, I have a list of things I gravitate toward time and time again. The other day I was in there shopping and thought it’d be fun to share my favorite staples that I’m always picking up here. If you aren’t a regular at HL, then you might not know that everything tends to be on sale at some point. Most everything will be on sale at 50% off every other week. If I need something, then I always wait until it’s on sale. If it’s not on sale today, then it will be next week. Seasonal decor usually starts out at 40-50% off and then will be marked down further once the season is over. Some items never go on sale, so you can use the 40% off one item coupon for those. 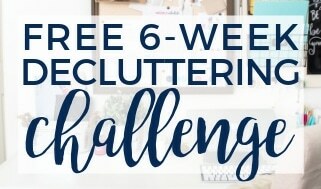 I pull mine up at HobbyLobby.com on my phone when I’m in the check out. But you can always print it out at home before hand. 1. Corbels. These are a more recent addition to the Hobby Lobby lineup. 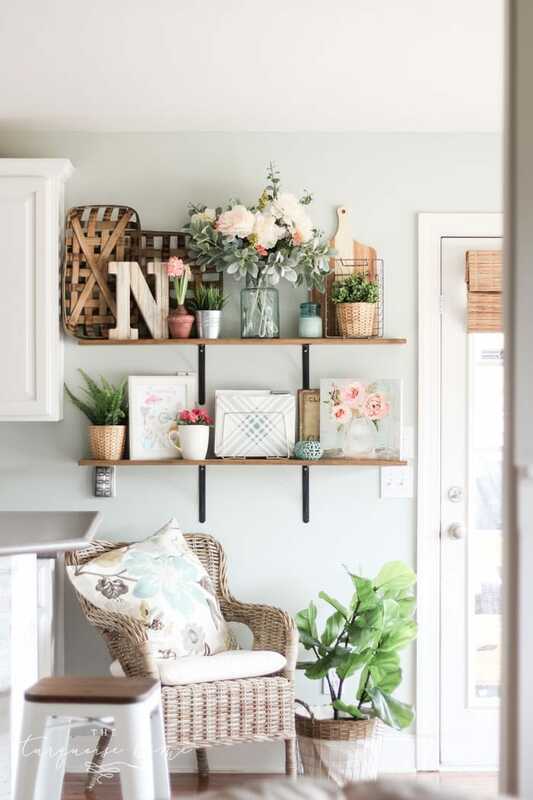 I find that they are really zoning in on the farmhouse style and the old, chippy look since it’s been sooo popular for a while now. 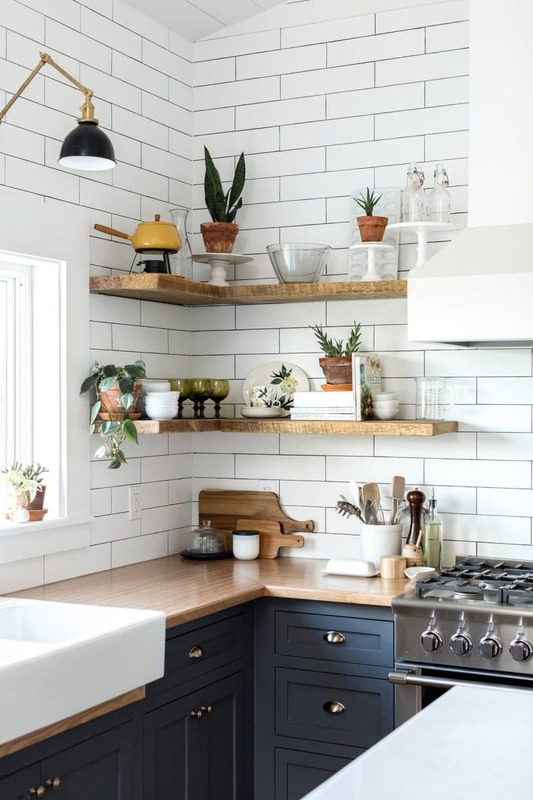 But corbels have been around forever in decor and design, so I love that there is now a quicker, cheaper option than hunting down some antique corbels. 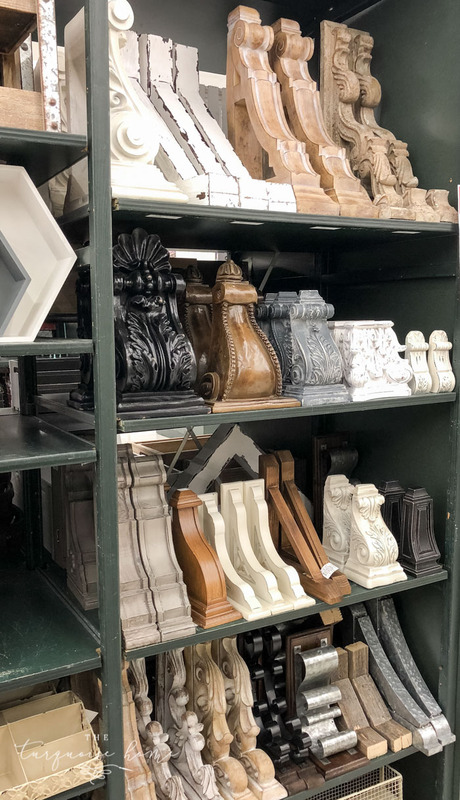 They have a corbel section, but I also love their white, chippy corbel book ends that I found in the front of the store on a display shelf! Look around for those, or you can find them here online. The white, chippy corbel book ends are currently on my mantel. 2. Faux greenery. 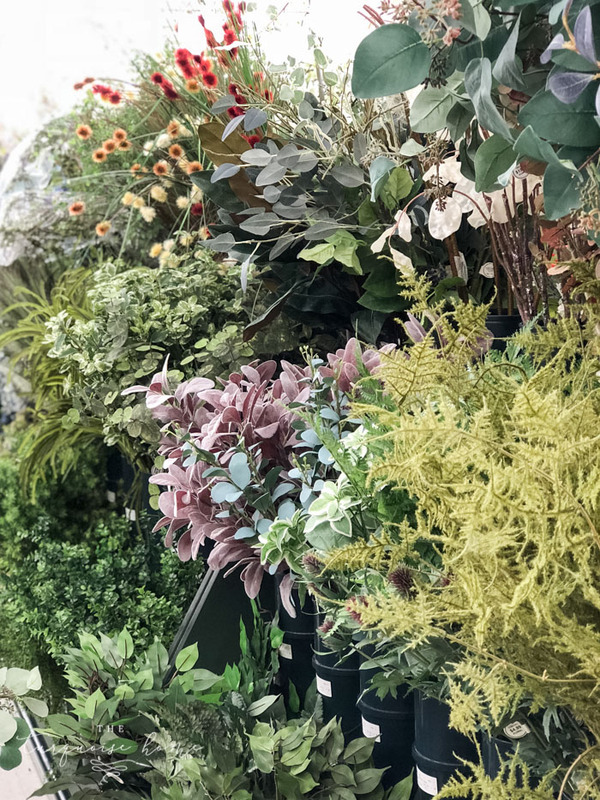 I’m obsessed with faux greenery, so I stop here first for any of my greenery needs. Their green lamb’s ear stems are the cheapest and most authentic that I’ve found. They tend to sell out in the store when they are on sale, so go early on Mondays if you want them, but you can always grab them online (here). I also love their seeded eucalyptus sprays. Also love this adorable bay leaf topiary that I just order and this huge fig leaf fig for a crazy good price! All of this green lamb’s ear you see here is from Hobby Lobby. I have the seeded eucalyptus in the olive buckets. 3. 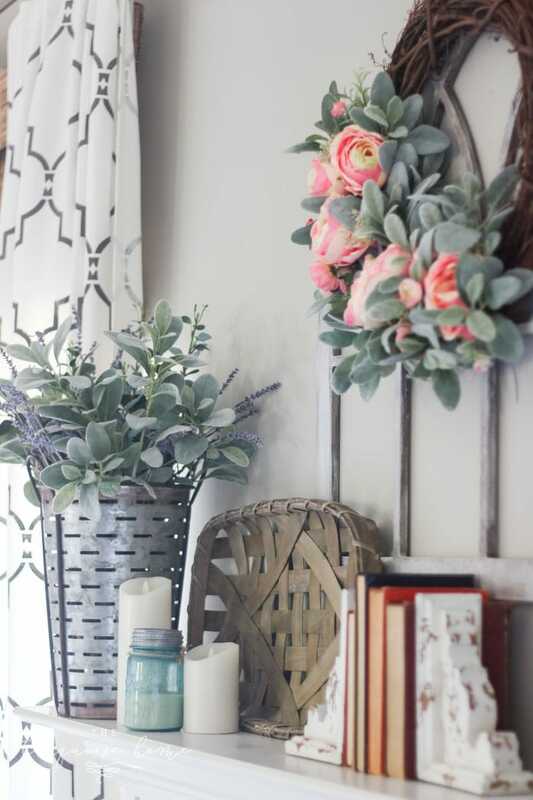 Faux Flowers. I love me some “faux”-liage. I have a black thumb, so I cannot keep anything alive. I also need my blooms to last, so I tend to hoard my floral stems from the store. I’ve got a ton! 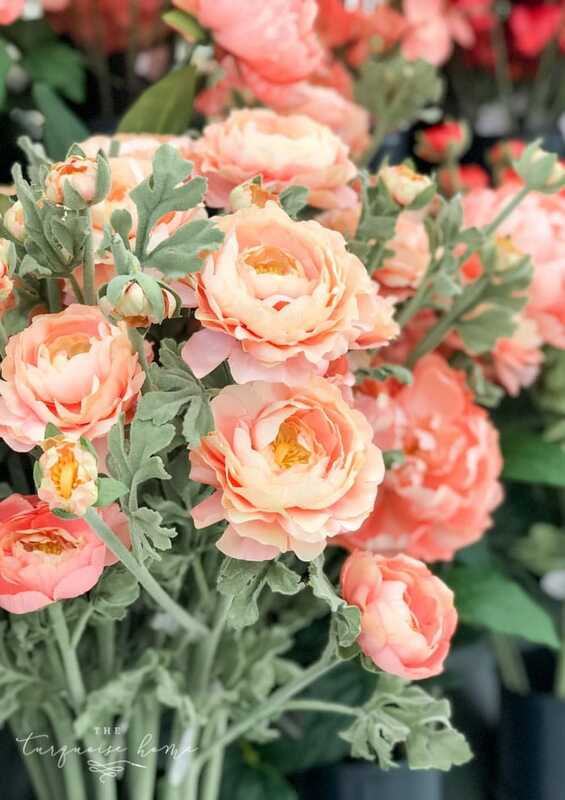 I’ve found that buying a floral arrangement bunch is cheaper than individual stems. But I buy whatever I’m looking for at the time. 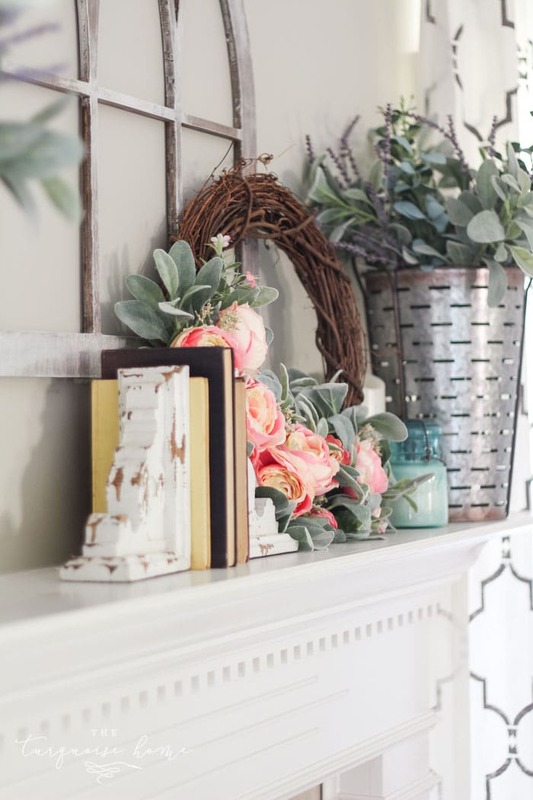 You can see their faux lavender on my mantel in the photo above. 4. Craft Wood Section. Y’all! 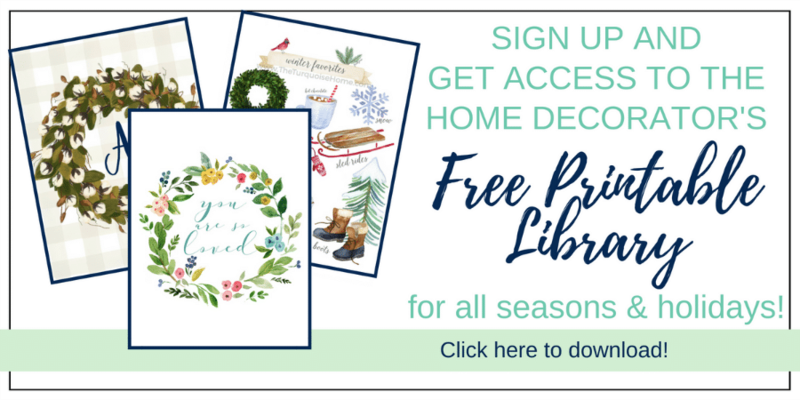 If you’ve ever wanted to make a sign or some kind of craft project that needs a wood board. Or even need a piece of raw architectural decor to make your own, then I have a treat for you! They have really built up this section, so there are most any option you would need. I remember the days of pulling board from a pallet to be able to make a sign, but no more! They have every type of board, fence piece, window frame that you can imagine. Well, maybe not everything, but the basics are covered. Love this section. 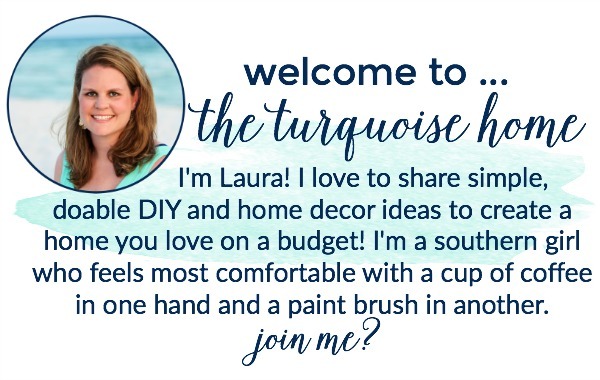 Find my sign tutorial here, but just skip the part about making the sign, because you can just buy one! Actually my sign is bigger than any of their sign pieces, but if you need a smaller sign than mine, this would be a perfect solution! 5. Frames. This is my go-to spot for frames. Every other week they are 50% off, which is a great price. 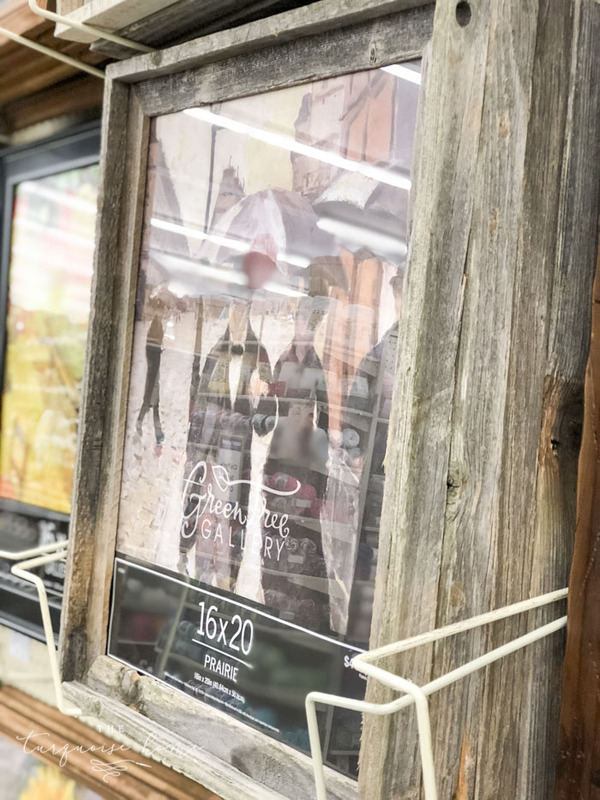 I love their barn wood frames because they are just my fave. But they every style and size! They even have open frames or super fancy frames. Just wait a week or so until they are on sale and you’ll get an awesome deal! 6. Signs, Art, Wall Decor. Oh my word. 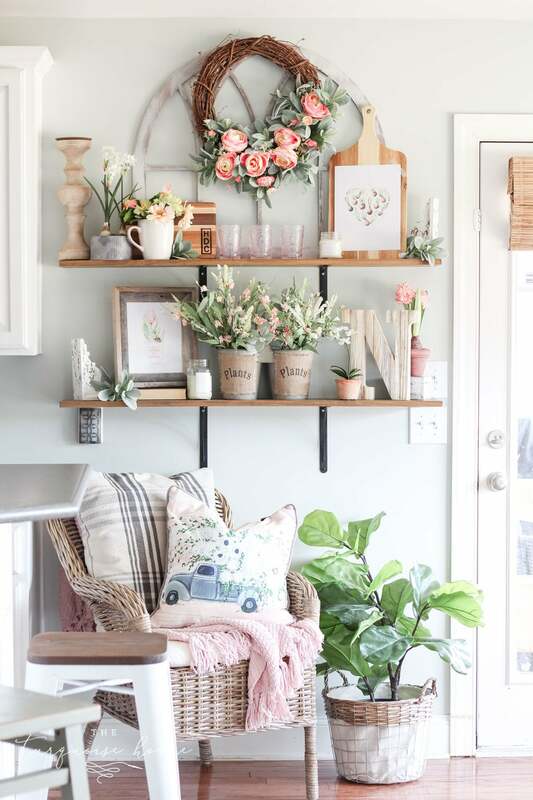 If you love signs in your home with a lot of personality – every personality – then you have hit the jackpot. 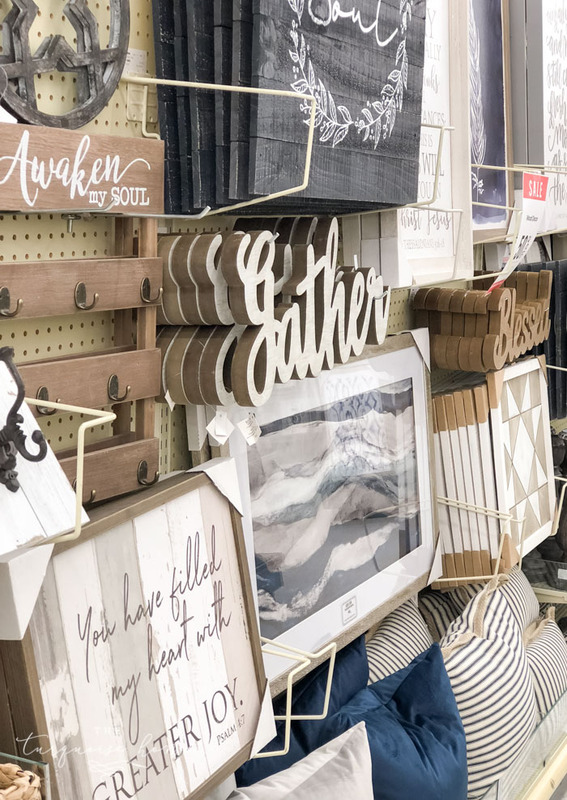 You will find rows and rows of every kind of sign at Hobby Lobby. They are great! 7. Tobacco Baskets. I know tobacco baskets have been popular for several years now. And are probably on there way out as a design trend. But if you love something, then buy it, right? 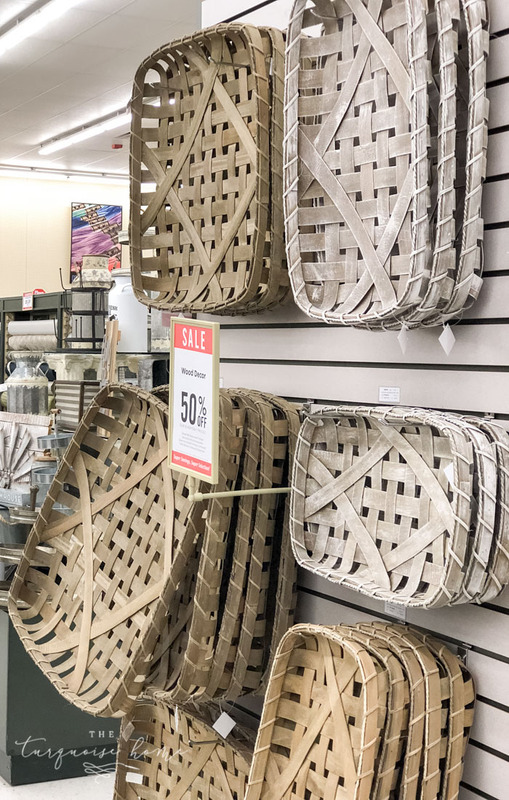 If you still want a tobacco basket, then Hobby Lobby has a ton of replicas. Look for displays and end caps for groups of them! 8. Knobs. If I am ever in need of a knob, this is my first stop. 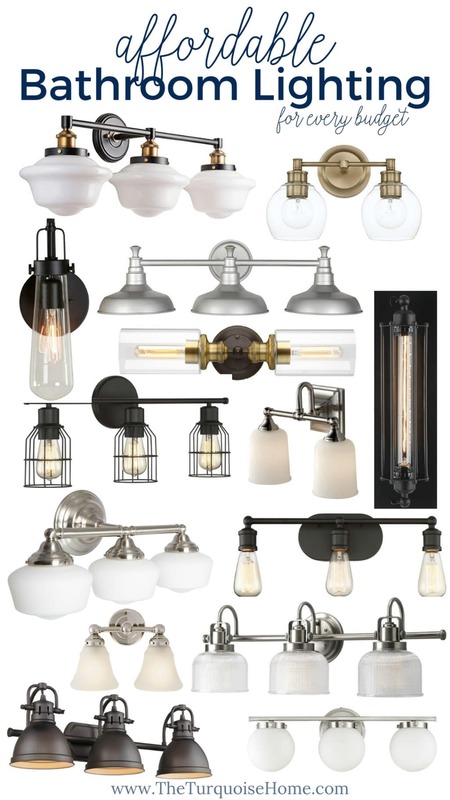 The selection is great and the prices are even better. Can’t beat it! 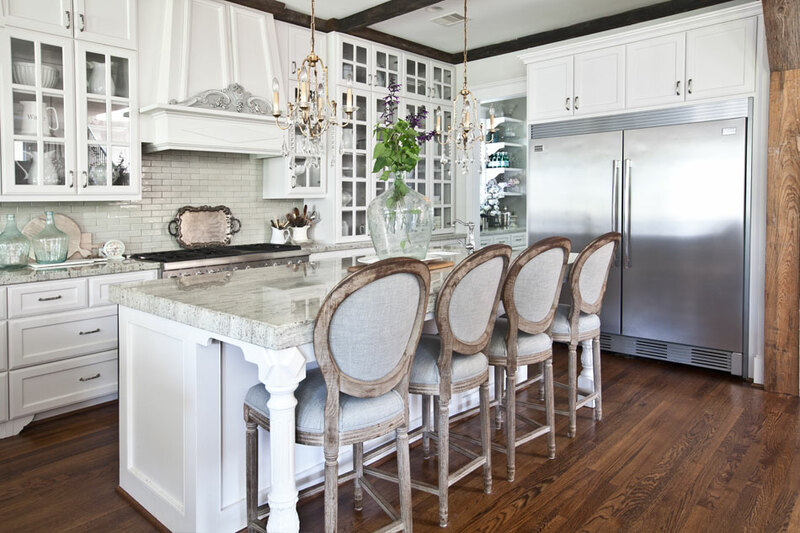 I recently replaced the knobs on my kitchen table with knobs from here! Love them! 9. Letters. If you need to spell something you, Hob Lob’s gotcha covered. They have every shape, size and finish you could imagine! I did a fun twist on an initial for my daughter’s room here. 10. T-shirts. 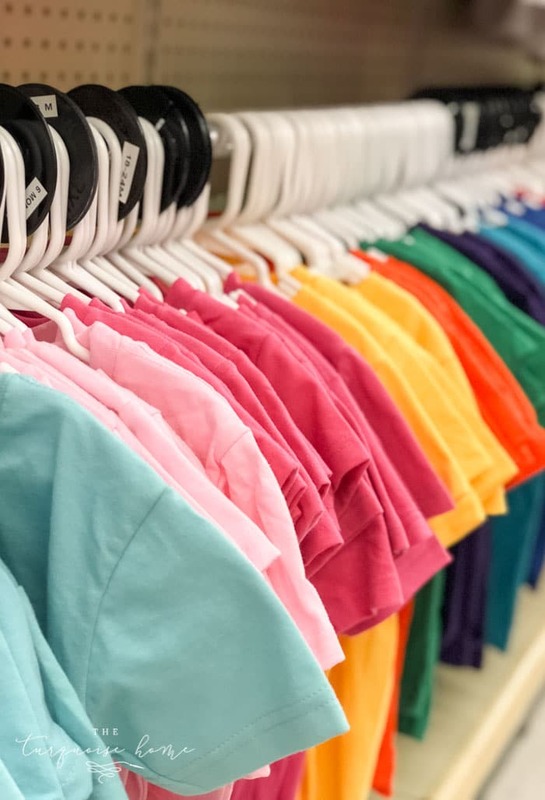 I don’t know about you, but kids are always needing a certain color plain t-shirt for school. But they are also great for craft projects with some heat transfer vinyl! 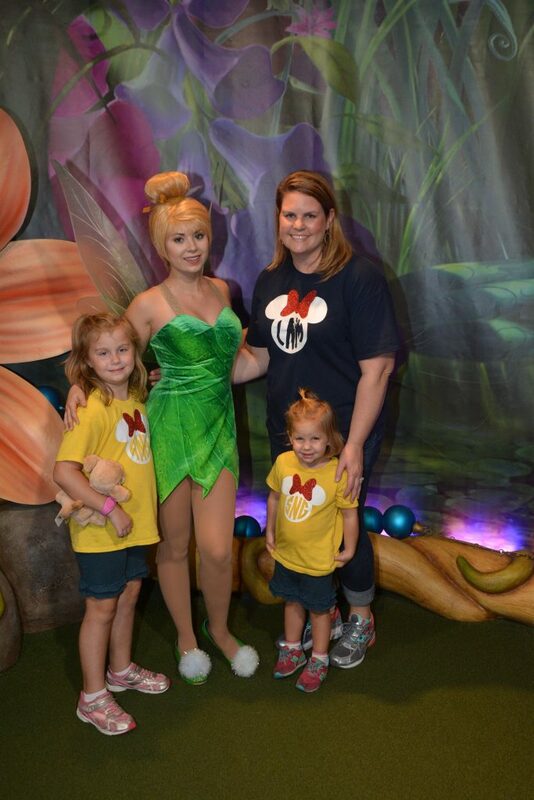 When we went to Disney World last fall, I bought a bunch of plain t-shirts and had them personalized. They turned out so cute! 11. Mirrors. 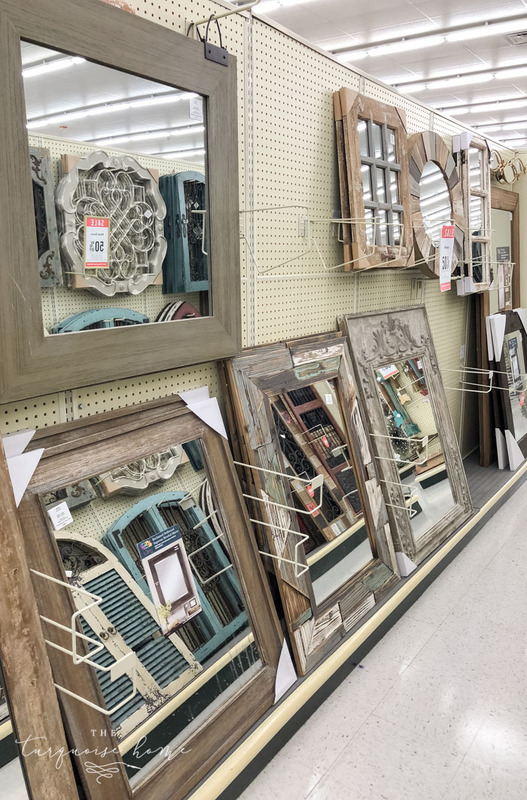 You probably wouldn’t think of Hobby Lobby when it comes to buying mirrors, but they have great huge mirrors for a great price. Why? Because as you know by now, they are 50% off every other week. What!? You can get a custom-looking mirror for less than I bought a large mirror for our bathroom in our last house from here and loved it. Whenever I get around to making over our master bathroom, I plan to buy my vanity mirrors from here. You just can’t beat the price and selection! See that huge floor mirror down at the end of the aisle? It’s $85 on sale. Seriously! 12. 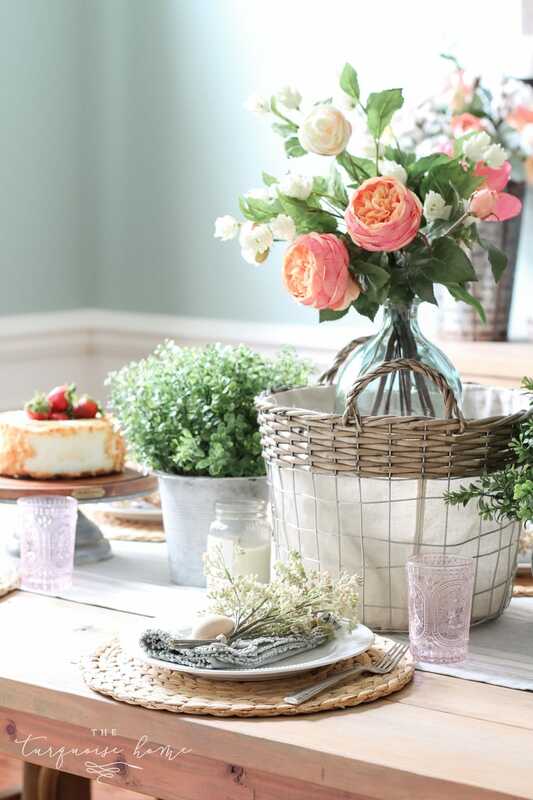 Glass Jars and Vases. 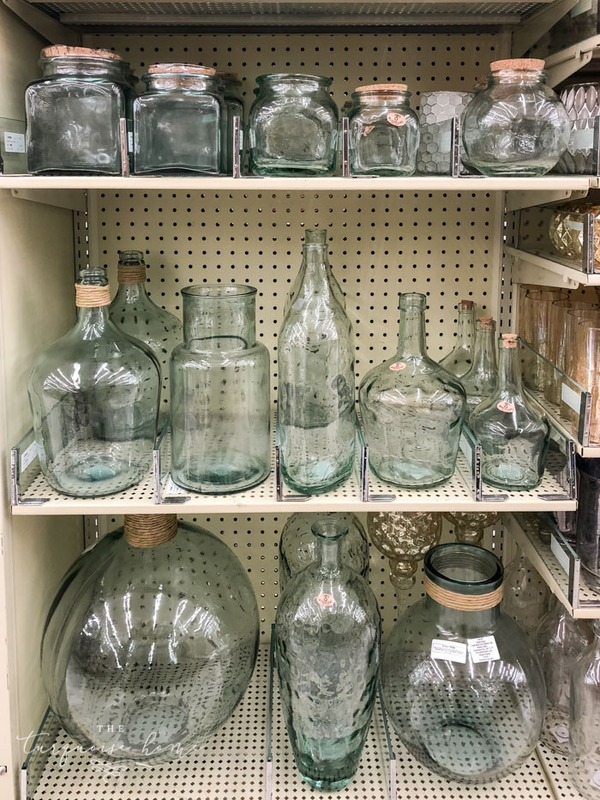 I love to grab any kind of candle holders or vases at Hobby Lobby. They even have a whole blue tinted glass section full of pretty containers for those of us who love turquoise! Yay! Don’t you just want to go shopping now? 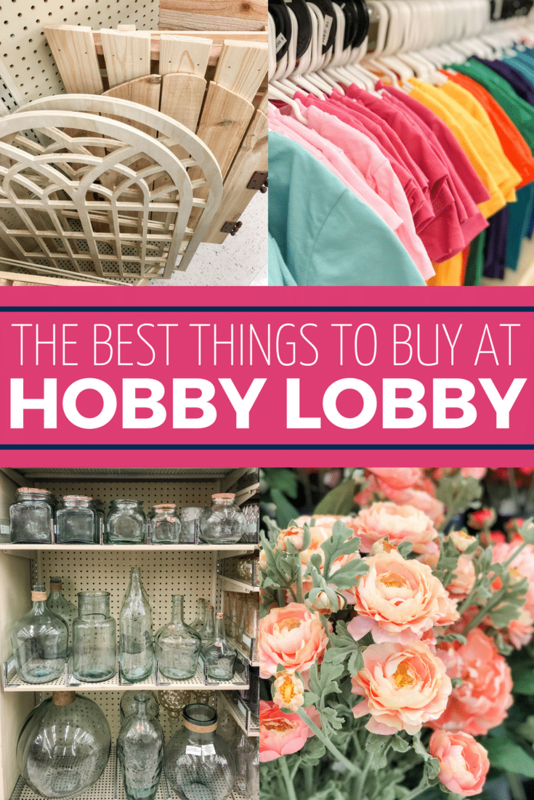 There are a ton more things I buy at Hobby Lobby, but these are my staple pieces and where I go first when shopping for these items. Let me know what is your favorite thing to buy at this store! Love love Hobby Lobby. I love the seasonal decor. Christmas decorations. Berry sprays and stems Autumn pumpkins Easter rabbits! And spring flowers. Really EVERYTHING!! My favorite place to shop!! I like Hobby Lobby, but I only go in when I need something specific. It’s too easy to get sucked into all the stuff. Most recently, I bought a really cute lamp, on sale, and I absolutely love it. They don’t stock it any longer. I do shop in the fabrics when I need to sew something and I wait for the coupon so I can really save. Awesome post! 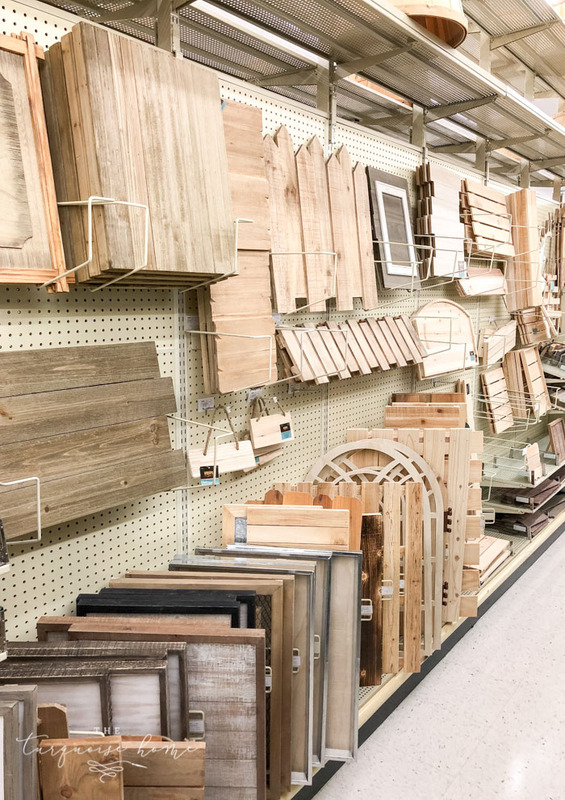 I enjoy shopping at Hobby lobby for my home/ office needs. It’s a plus they have such great standard in such a low standard society. Closing on Sundays and their values are right on! I support Hobby Lobby all the way!! You hit the nail on the head with the items you mentioned on your article. Those are most of the items I like to stock up on also, plus paper craft items. 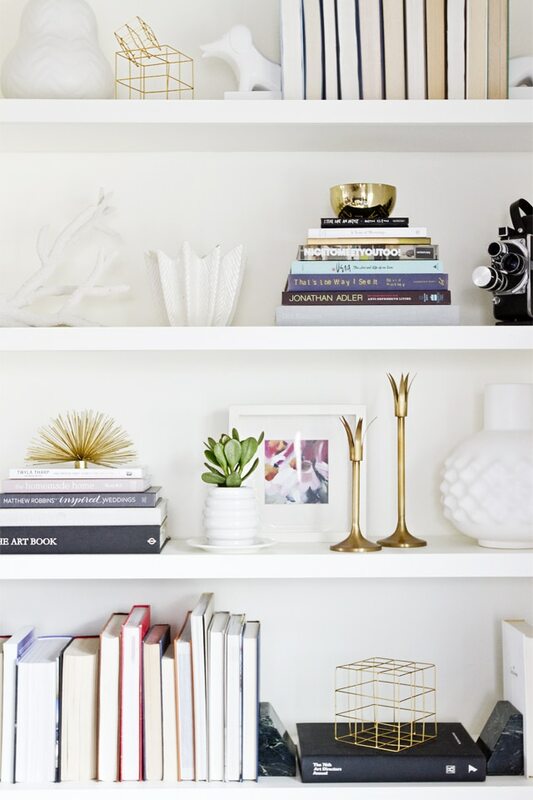 They carry great items that fit into any decor. 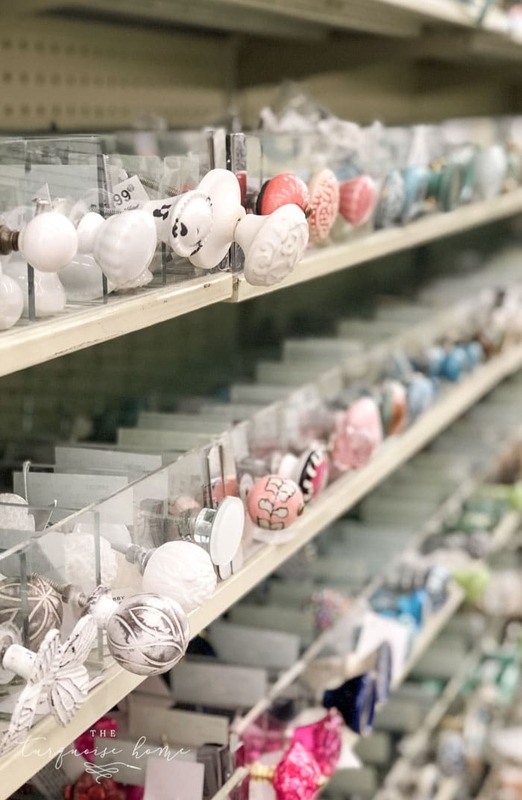 I’m excited about a new Hobby Lobby opening up about 2 miles from my home this coming week. I won’t need to drive clear across town to shop. Kudos on your finds. Enjoyed your ideas. I wish we had Hobby Lobby in Canada! I went into one for the first time this past November when I was in Ohio – I think I could have maxed my credit card in there!! 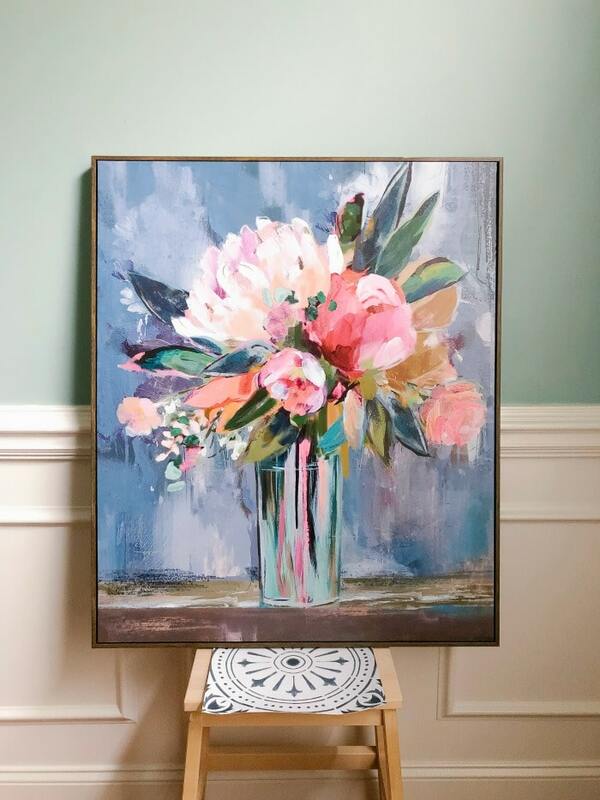 I like hobby lobby too but not for Home decor and I’ll tell you why…most everything is cheaply made in China and a copy of what real people put their hearts and souls into. 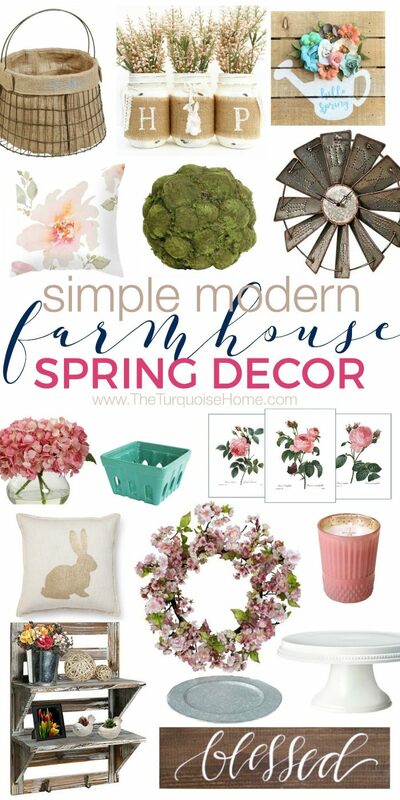 Want some farmhouse style? Go on Etsy or to a craft fair or an antique shop and buy from a small business….part of the fun is the thrill of the hunt, don’t you agree? Thank you for supporting local and small businesses! We need you. 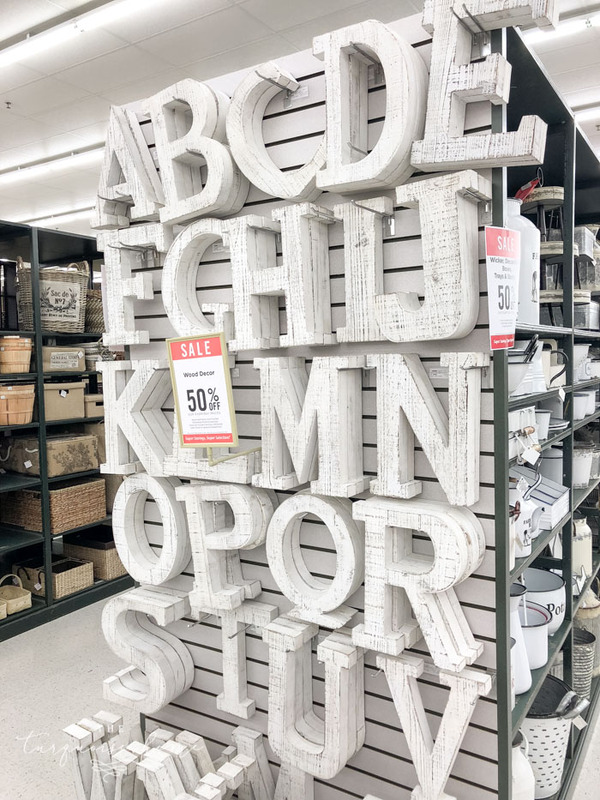 Now I want to go shopping at Hobby Lobby! Sadly the nearest one for me is 45 minutes away.